Test Your Sonic Knowledge, Win Prizes! Home » Competitions » Test Your Sonic Knowledge, Win Prizes! 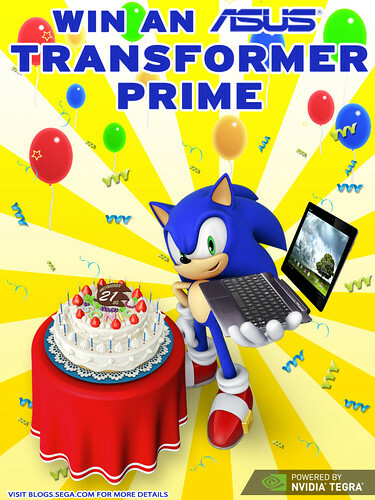 With Sonic’s 21st birthday a mere 36 hours away (At least from the British perspective! ), SEGA of America is offering its US-based fans the opportunity to win some awesome prizes! All you have to do is pop over to SEGA’s blog, read the rules and then answer a handful of simple Sonic themed trivia questions! Though be warned, there are a couple of techie Tegra-3 related questions thrown in for good measure. There’s a total of 14 prizes up for grabs, with the star prize being an ASUS Transformer Prime tablet PC! Good luck if you plan to enter! The contest ends on June 30th, so make sure to get your entries in fast. That canNOT be a coincidence.